At 39, Neftali Duran has held many titles in his life: chef, restaurateur, food justice advocate, activist, educator. (His first name, by the way, is pronounced with the emphasis on the i.) After spending the better part of two decades cheffing at French, Italian and New American restaurants—and owning two of his own—Duran has left commercial kitchens to work with inner city youth. To him, the leap makes perfect sense. Upon immigrating to the United States from Oaxaca at age 18, Duran found back-of-house work at restaurants in Los Angeles. Since then, he worked his way up through the ranks to own concepts of his own—among them a wood-fired sourdough bakeshop he ran in Massachusetts for over a decade. He also has worked for a number of non-profits surrounding food justice and access. Much of this work has a keen intersectional focus on POC (people of color) and indigenous communities, as well as female empowerment. 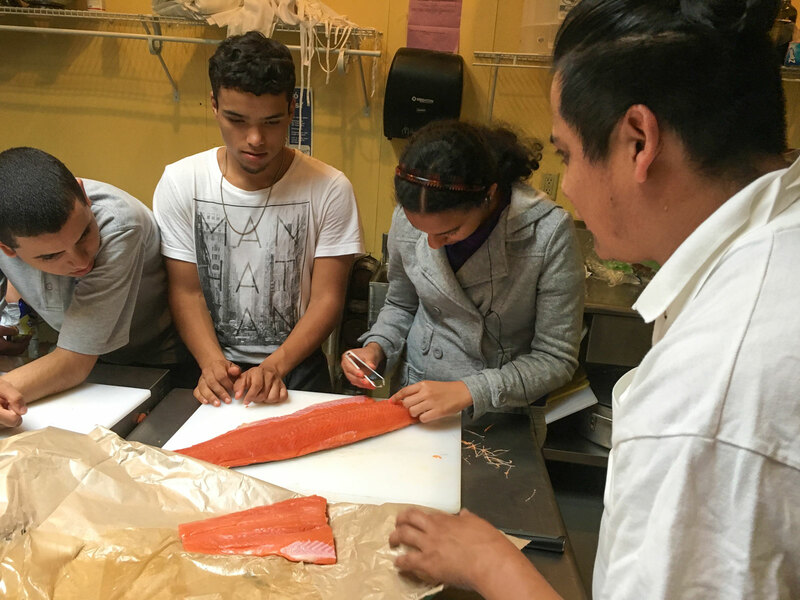 During the school year, Duran spends a significant chunk of his week teaching classes of teenagers about food justice in Holyoke, Massachusetts. Despite the city’s shared namesake with the nearby esteemed liberal arts college, most of the teenagers at its Paulo Freire Social Justice Charter School come from lower-income, urban areas. In census data from 2012 to 2016, Holyoke ranked as the fourth poorest city in the state. A third of the city receives SNAP, or food stamps, Duran tells me—and according to some estimates, 650,000 more people qualify, but haven’t signed up. “We live next to the asparagus capital of the world,” he says. That’s Hadley, Massachusetts: Though its asparagus bounty has lessened since it officially earned that title decades ago, the crop here—still painstakingly hand-picked, because of the erratic way the plant grows—is some of the most tender and sweet anywhere. Of course, that statement itself is inherently political: the idea that some communities rely on government aid more than others because they’ve been systemically cut off from their own resources through colonization and segregation—not because of a failure to pull themselves up by the bootstraps. Contextualizing these policies, he hopes, will help dislodge some of the shame attached to them. The class discussed the farm bill recently, for example. (This syndicated Salon piece, by former U.S. Secretary of Agriculture Tom Vilsack, is an easy-to-understand primer on it.) The farm bill is a comprehensive set of legislation, renewed every four or five years, that affects not only farmers’ loans and crop insurance, but also how (and if) 43 million Americans receive food stamps. And many of Duran’s students are among them. When they go to their corner bodegas, they see that tortillas and white bread are cheap, but zucchini is expensive. “And they get it. They’re like, ‘Oh yeah, it’s because of subsidies to corn and soy and wheat,’” he says. Despite the food insecurity of many of these students—all of them receive free lunch—almost half the cafeteria food is wasted, according to a plate study that was administered. These teenagers are hungry, but the food is just not that good. Duran says this in not so many words. Like most food served in well-intentioned but underfunded inner city schools, the meals can be processed, pre-packaged, lacking in flavor and color. It’s not what most of us would want to eat, so why do we expect them to? “Kids know what good food is,” Duran says. “Even something simple like rice and beans—you can have really good rice and beans, and kids know what that tastes like.” A palate, then, is not a privilege—it’s universal to being human. We all crave; we all discern. 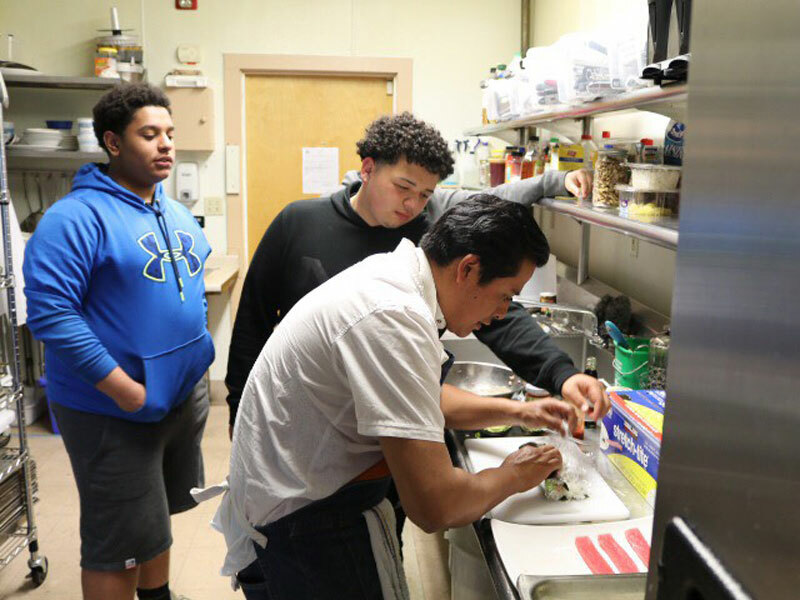 Twice a week, Duran and his co-instructor, Isis Feliciano, bus the kids from school to an off-site kitchen. Sometimes they go on field trips. “High school is a chaotic environment, and learning happens best when we remove them from it,” he says. Recently they went to a recycling plant to trace the lifecycle of plastic bags. “The people there are really good at explaining things to kids,” he says. Bags basically end up in one of two places, kids learn: the landfill, or China. China is where everything goes to be recycled. The plastic that ends up in the landfill can leach into the groundwater system, despite double liners. Between 2007 and 2008, over 350 inspections of Massachusetts’s landfills led to 18 notices of violations, according to a state report. These leaks are to say nothing of microplastics—the tiny particles of plastics that end up washed into the ocean, consumed by fish. Just to drive everything home, the following week, the class makes sushi. One of the most impressive parts of the course is the food shopping challenge, where Duran takes his students to the bodega or grocery store. “Now, imagine you have to have to feed your whole family,” Duran tells them. “You have $10. What are you going to make? And you have to have some kind of veggies, or make it as nutritious as possible.” It seems like a reality show, but for some of his students, it’s just reality. A very basic pantry is assumed; salt and pepper, olive oil and a few spices are freebies. A recent class cooked up broccoli chowder, fresh garlic bread, beef stir fry, and bacalao salad—salted cod in vinaigrette, with Puerto Rican roots. “The team really wanted to make fresh lemonade, but it would’ve put them over budget,” Duran says. You can see the full meal below. “We want to show these kids, you’re worth it. You deserve good, healthy food,” he says. For many of them, that’s a shift from their existing reality—and it’s one that Duran has seen first hand. After crossing the border in Tijuana in 1997, he found himself washing dishes in L.A. He fell into the restaurant industry by default—but it proved to be a natural extension of his personal love affair with food. “Growing up in Oaxaca, I was so spoiled by my mother’s and grandmother’s cooking,” he says. In the process of helping out—bringing firewood, carry nixtamal—he was exposed to the importance of cooking from a young age, and the power of women as knowledge holders. He remarks on the dearth of female Michelin-starred chefs in the United States—even though women are the ones who've been feeding societies for thousands of years. This is, of course, a criticism against the Michelin Guide, not female chefs. In our patriarchal society, Duran maintains, home cooking has not been valued in the public sphere. Similarly slighted have been certain “ethnic” cuisines, viewed as mutually exclusive with fine dining. So he got his education in commercial kitchens, and eventually opened up two concepts of his own. Although he’s since left them, he talks about opening a tlayuderia some day. It would churn out Oaxacan tlayudas, crisped tortillas as large as pizzas, topped with a confetti of cheeses and meats. The school semester ended two weeks ago. It’s unclear where funding for the next will come from—until then, classes have been put on hold. “I would gladly continue to do this work, but sometimes we have to take a break depending on funding,” he says.